In 1888 wine merchant Oskar Davidsen obtained a restaurateur’s licence and opened a wine bar in connection with his wine shop in Copenhagen. However, when the guests felt hungry as well, Petra Davidsen went into the back and created ”smørrebrød” (Danish open sandwiches) for them. This is how it all began….. And it developed. The regulars came punctuously at lunch time in order to feast their palates and stomachs on the delicate ”smørrebrød” created by equal parts of pure raw materials and gastronomic imagination. New customers came. And the reputation of Davidsen’s ”smørrebrød” reached the entire country. 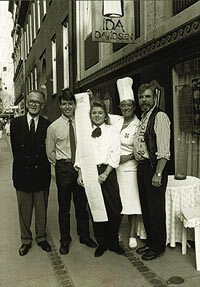 The famous list of ”smørrebrød” was created during the first year of this century. 178 variations over a Danish theme: ”Smørrebrød”. The list is more than 140 centimetres long. The longest in the world. And of course, it has achieved a place in the Guinness Book of Records. However, it is neither quantity nor length which has caused the ”smørrebrød” to be an international success. It is the quality. Through a 100 years, Oskar and Petra Davidsen were succeeded by the son Vagn Aage Davidsen. Then came Vagn Aage’s son, Per Davidsen – supported by his wife Hedevig (Numme) Davidsen and the partner Axel Svensson. In 1965 the path was set from the ”old house” on Åboulevarden to Søpavillonen, where Restaurant Oskar Davidsen manifested its Danish and international reputation through the years until 1974. In the meantime, the fourth generation had entered the family business. Per and Numme Davidsen’s daughter, Ida Davidsen. 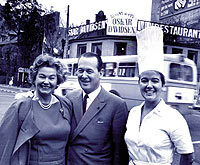 As the ambassador of ”smørrebrød” she made Danish gastronomy even more known and loved outside the borders of Denmark. Among other things, Ida Davidsen has prepared ”smørrebrød” for the guests at the Restaurant Scandia in Hollywood. For the passengers of British Airways and Canadian Pacific. She has headed the culinary strain at Danish campaigns many places in the world in cooperation with the Foreign Ministry and Danish agricultural organisations. Since 1978 Ida Davidsen has, together with her husband Adam Siesbye, been in charge of the gastronomic line and operation of a Danish restaurant at the Hotel Maksoud Plaza in São Paulo, Brazil. When the era at Søpavillonen ended in 1974, Ida Davidsen and Adam Siesbye opened the Restaurant Ida Davidsen at St. Kongensgade 70, where they, together with the kitchen and restaurant personnel, carry on the 100 years old unbroken family tradition of quality and Danish food culture. and Per Davidsen and Ida. Three generations of the family Davidsen. The restaurant is open Monday to Friday from 10:30 -17:00. Kitchen closes at 16:00. NB! We will gladly open for special arrangements and private parties.